Ilex x meserveae 'Blue Angel' is a dense, upright, evergreen holly. It features small, dark blue-green spiny leaves, dark purple stems, and white flowers in spring. These are followed by bright red berries in autumn, if planted near a male variety. It is slow-growing, eventually reaching a height of 3m-4m. 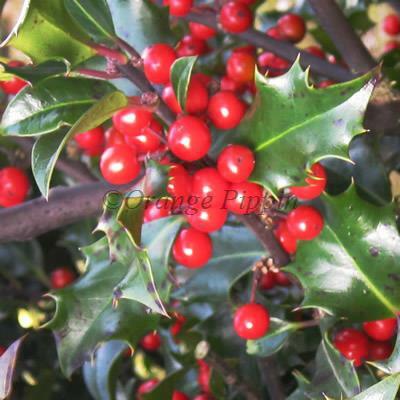 The species Ilex x meserveae is hybrid of two holly species, Ilex acquifolium and Ilex rugosa. Most forms of this species, including 'Blue Angel', have a characteristic blue sheen to their dark green leaves. 'Blue Angel' holly is an easy shrub to grow, and is ideal planted as a specimen or within a mixed border to create an architectural feature. It's dense branches and leaves mean it can be used as hedging. It is happy in full sun or partial shade, and is very cold-hardy. Like most Hollies, 'Blue Angel' does best in free-draining fertile soil. If you have heavy clay then improve the planting area with soil conditioners first. It tolerates both slightly acidic or slightly alkaline soils. 'Blue Angel' is a female holly variety, and will need a male plant nearby in order to produce berries, e.g. 'Blue Prince'.